Delivery: Order by 11am for next day Delivery in UK and Mainland Scotland Home or Business address. Deliveries to Channel Islands, Scottish Higlands, Nothern Islands, and certain Postcodes delivery may take 2 -3 Working days. Next day Flowers delivery is available from Monday - Saturday except Sundays and Bank holidays. Orders received after 11am GMT on Friday will be despatched on Monday for Tuesday Delivery. For more information please contact Customer Support Team to check Availability and Delivery to your requisite delivery Address. Substitution: All Flower deliveries are subject to product and seasonal availability of Products. 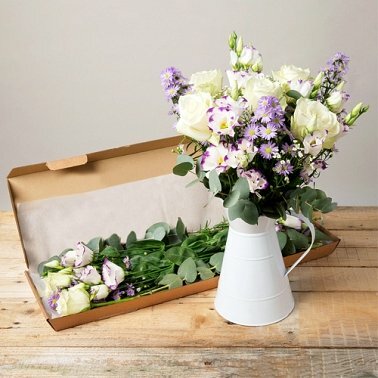 although we try to keep the colours the same as shown in the pictures however on rare occasion Flowers or sundries items may be substituted to ensure your order arrives on time. In some cases, where we do not have some items referenced in the product description in stock, a careful substitutions of equal or greater value will be necessary to match the Theme of the Gift Hamper. In those cases, when possible, we will ask you for permission by Email or Phone to make a substitution. If we are unable to reach you, didn’t receive your reply or there is insufficient time to do so, we will proceed with the substitution.